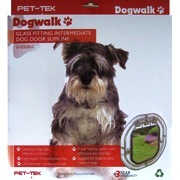 We stock Cat Mate, Catwalk,Dogwalk and Transcat, we also make a range of doors. We can also make to order any size or shape for glass fitting. Please note that if any cutting or handling of glass is required, you will need an experienced glazier. Strong 6mm Perspex frame and 4 - 5mm perspex flap Magnetic silent, self closing Stainless steel hinge and fittings (no rust) Chrome on brass barrel bolts for secure locking, can't be accessed from outside Suitable for most sliding doors, minimum clearance required 10mm inside, 12mm outside This door must be installed into pre cut toughened glass, ideally 5 or 6 mm BUT CAN BE INSTALLED INTO THICKER GLASS INCLUDING DOUBLE GLAZING BY USING LONGER SCREWS AND SPACERS TO SUIT. PLEASE ADVISE AT TIME OF ORDER. 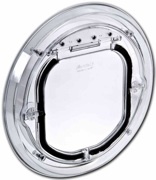 The locking panel is not accessible from the outside making it more secure. 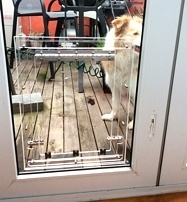 Being opaque the dog can see that the door is locked. The door comes with spacers to fit between the inside and outside frame to suit 4, 5 or 6 mm toughened glass - that means no gaps to gather dirt. Doors must be installed into pre-cut toughened glass, toughened glass,ideally 5 or 6 mm BUT CAN BE INSTALLED INTO THICKER GLASS INCLUDING DOUBLE GLAZING BY USING LONGER SCREWS AND SPACERS TO SUIT. An obligation free measure and quote available on request. Doors cannot be installed into an unfenced pool area. Strong 6mm Perspex frame and 4 - 5mm perspex flap Magnetic silent, self closing Stainless steel hinge and fittings (no rust) Chrome on brass barrel bolts for secure locking, can't be accessed from outside Suitable for most sliding doors, minimum clearance required 10mm inside, 12mm outside. 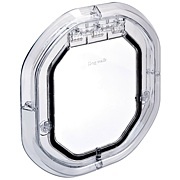 This door must be installed into pre cut toughened glass, ideally 5 or 6 mm BUT CAN BE INSTALLED INTO THICKER GLASS INCLUDING DOUBLE GLAZING BY USING LONGER SCREWS AND SPACERS TO SUIT. up to 600 mm shoulder height.